It is not possible to remove the "'xtra" when showing length. Hopefully that can be addressed in future updates. Thanks! I would love to see this (and maybe the ability to reformat the length text)! I'm bumping this thread up because I just opened the same show file in VW 2018, and I'm disappointed to see that this is still not an option. Is there a process to officially request this as a feature for future updates? I already have little need for the "extra" amount to be shown (my electricians know the space and know how much extra to expect, it simply clutters the plot), and especially since I am drawing out-of-scale with the rest of the plot (because the cable tool doesn't take 3D model shape into account, so a "50ft" run may actually be 50ft horizontal and a 25ft drop at the end that isn't show in my plot) the amounts I get are completely wrong. ...since I am drawing out-of-scale with the rest of the plot (because the cable tool doesn't take 3D model shape into account, so a "50ft" run may actually be 50ft horizontal and a 25ft drop at the end that isn't show in my plot) the amounts I get are completely wrong. 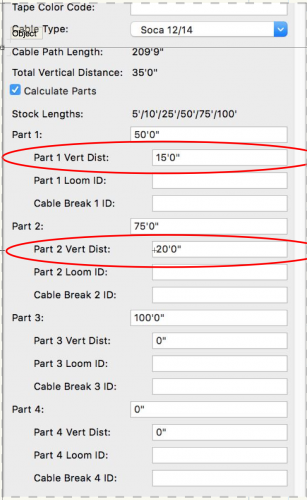 You should be able to type in the value of the vertical runs into the vertical distance parameter of any part so that your amounts are correct. Thank you for the recommendation. I do need to play with the parts feature some more, however my primary concern is the inability to hide the labels. 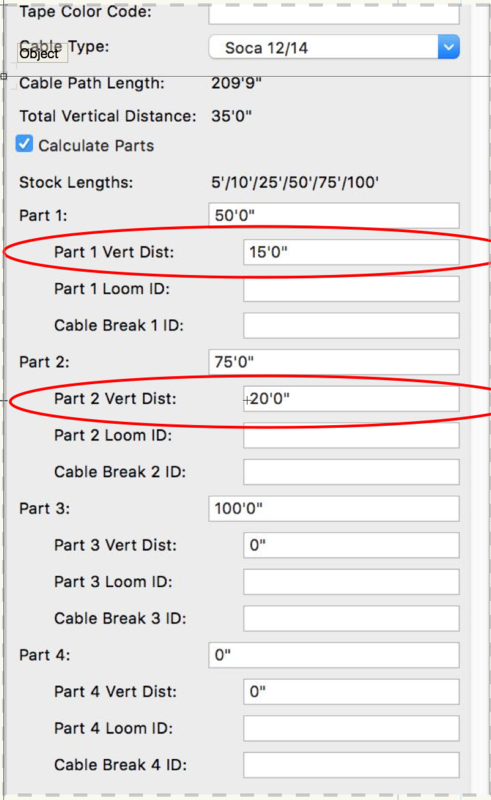 The show calls for some complex cable runs that aren't possible to draw to scale in the paperwork, however if I calculate the needed length for these complex parts, this feature may help! I'll take a look into drawing to scale this time around, and see if I can at least make the lengths line up with the real-world runs better so the extra amount is more realistic, if still impossible to hide. Play with the check boxes under the "Display On Drawing" divider. 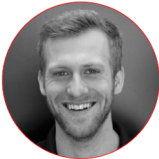 You will not have anywhere near the control you desire, but you will have much more than you seem to realize. 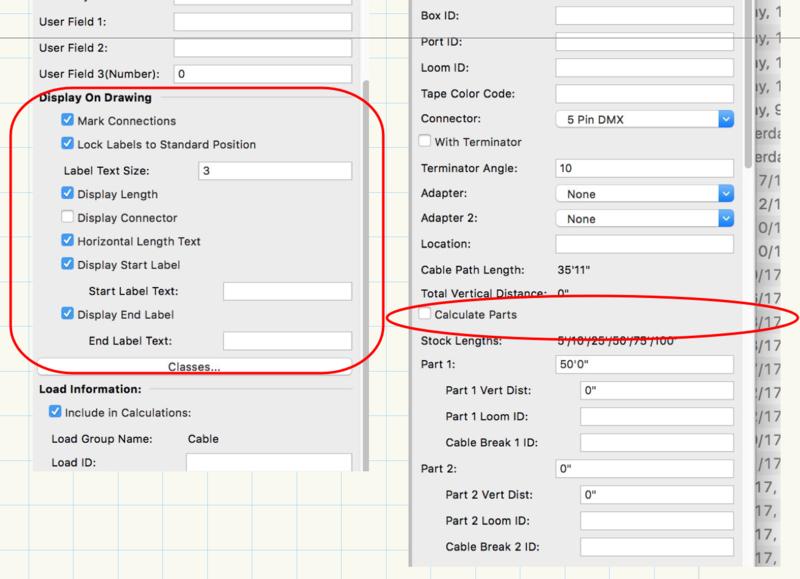 Also, unchecking the "Calculate Parts" button will allow you more freedom in assigning part lengths. I've poked around those display options a bunch already, but unfortunately the extra length label is part of the length display, which I do want. Thanks though! I really hope this feature is added in 2019. It is very tedious to not display length and then go and type lengths in text boxes if you are trying to show a stagehand on a plot what length cable to grab for the jump without having the (x' Extra) displayed all over the plot making it unreadable.